A little creative navigation lead to an unexpected whirlwind tour of Charlottte with no injuries, tears or smudged make-up. RESULT! A descriptive term for something that looks or behaves like a mug? In Charlotte the weather forcaster predicts hot, humid, thunderstorms and an ozone ‘code orange’ alert. We should not drive anywhere, paint anything and only re-fuel cars in the evening. We can drink two dozen mugs of Arnold Palmer then ask the server ‘who is Arnold Palmer’? The server’s amazement at my not knowing this golfing basic is evident. Think jaw hitting floor. Ooops. In Seattle when I greet or talk to the Latino people emptying the bins or cleaning the rooms at work they rarely reply, I’ve never seen them smile. I’ve learned to treat them as if they aren’t there. It makes me feel uncomfortable. I don’t know any Latino people. The only places I see them are on the streets or in support roles like gardeners or cleaners. Here in Charlotte the Hotel staff appear more open to sharing superficial niceties. I feel less akward being me. Tropical storms and their bigger sibbling ‘hurricanes’ are a completely new experience for me. this is not a case of ‘flash’ red-eye. 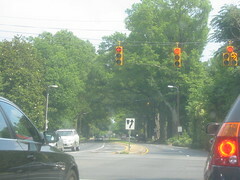 These are traffic lights at dusk in a North Carolina spring after a rainstorm that caused traffic havoc. Havoc included police cars with very pretty lights, ambulances and collections of crumpled cars on the edge of the road. Am I on the ‘right’ side of the road? Museum of History. Wendy winces. At this rate of wincing I’m going to develop a permanent tic. On flick-r there are more of my photographs of Charlotte. 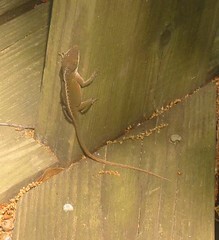 In the Andrew Jackson State park we saw this Anole Lizard. I’ve never seen one before. It was about 10 inches long from nose to tail. Lots of places and people here are named after the Hickory. Local by President Andrew Jackson was nick-named â€œOld Hickoryâ€, Churches, roads and towns have Hickory in their name. A good local BBQ uses Hickory wood to flavour the meat. We tried some at the â€œOld Hickory Houseâ€. Good wholesome tasty food! Shagbark or Scaleybark (carya ovata) – prized for smoking meats, particularly pork. The nuts are also considered very good and an extract of the bark is used to make a syrup similar to Maple syrup. This tree appears to have many names including: shagbark, bigleaf shagbark, kingnut, big shellbark, bottom shellbark, thick shellbark, and western shellbark. Shellbark (Carya laciniosa) – dense, strong, elastic wood used for making tool handles, athletic equipment, furniture, construction timbers, firewood, and its wood chips are utilized in the smoking of meats. Bitternut (carya cordiformis) â€“ as the name implies, these nuts are not favoured by humans though they do appeal to squirrels.